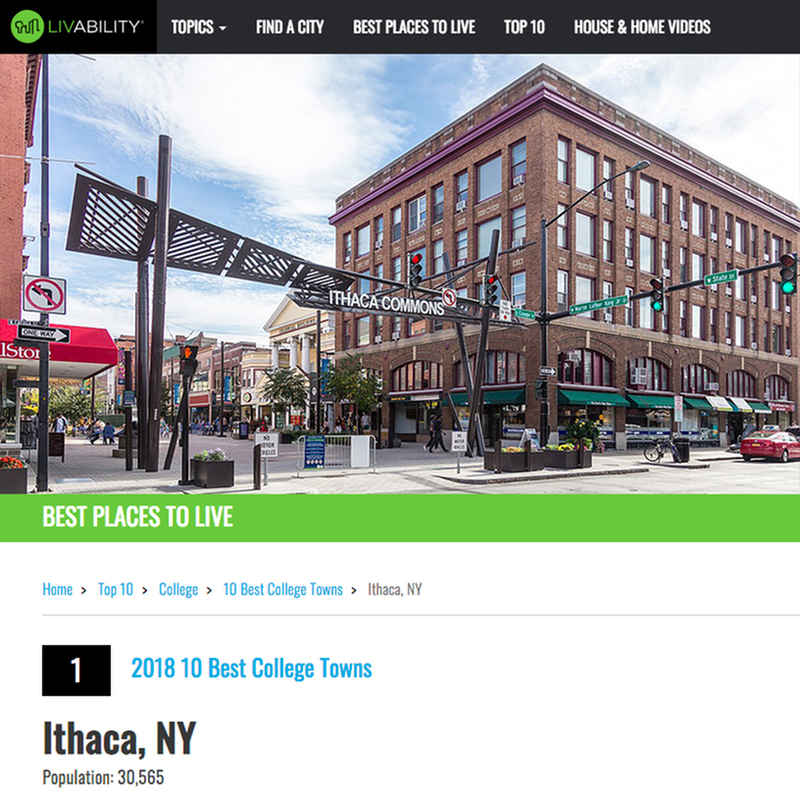 If you didn’t already know that Ithaca is the best college town in the country, Livability.com just proved it. The site gave Ithaca the top spot on its 2018 list of the 10 best college towns in the country. Ithaca earned the top spot in Livability.com's annual ranking! Students and locals alike take pride in Ithaca and all it has to offer for all types of people. Music lovers can enjoy the rich local music scene. Food lovers can try cuisine from all parts of the globe. Nature lovers can explore more than one hundred natural gorges and Cayuga Lake. Downtown Ithaca offers all the amenities of a big city with a small town feel. The Ithaca Commons is a great place for shopping, dining, events and more. For its ranking, Livability.com looked at all 203 towns that have at least one college and a population between 20,000 and 350,000. They used factors like the ratio of the city’s median salary to its July 2018 median one-bedroom rent, the percentage of the population age 20 to 29, the number of jobs in the education sector per 1,000 jobs in the city, and the ratio of the median salary in the city to the nation for education jobs to rank the qualifying towns. You can see why Ithaca also landed a spot on Livability.com's 2018 Top 100 Best Places to Live list? Want to live in Ithaca? We have an Ithaca Apartment to fit your needs. Check out our listings and see our Virtual Tours online or call (607) 273-1654.